♦ Is the cooking done by one person, or more than one person? ♦ How are the tasks divided? ♦ Are there special cooking or baking activites? How often? ♦ How many participate in clean-up? ♦ What is a typical meal? ♦ Who is left-handed and who is right-handed? ♦ Does anyone have special needs that might require a lowered countertop? The two most important aspects of kitchen design are function and safety. 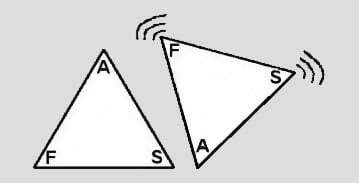 These form the base vertices of a triangle. This is what I call the “Principles Triangle”. The top vertex represents your kitchen’s appearance. Once function and safety are addressed, your kitchen can be any style, any color. If the triangle is inverted, it’s impossible to achieve safety and function after appearance. It takes years to learn all of the principles (and earn the professional credentials) to transform an outdated, dysfunctional, unsafe dungeon into a haven of fun-filled activity and harmonious gatherings. I can help you achieve the perfect kitchen to fit your budget, lifestyle, and personal preferences, and would love to chat with you about it! Call D. P. Design (503-632-8801), or send an e-mail to Diane, to get more information about how she can help you create a functional, safe and beautiful kitchen (or bathroom).